This photo tour of India takes the photographer from bustling Delhi, straight to the heart of North India. 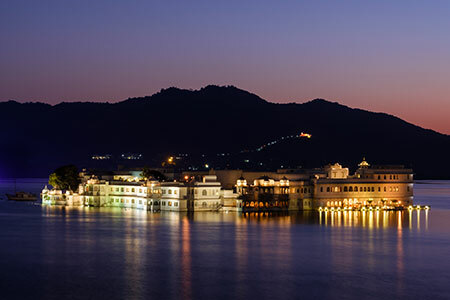 Locations including the Delhi, Taj Mahal, Pushkar, Jaipur, Udaipur, and Jodhpur. Rajasthan, land of Rajputs and Maharajas, an epic photo adventure to fairytale palaces, magnificent forts, and of course the dizzying Pushkar Camel Fair. Do you love to travel and also want to learn to take better photos? Maybe you've taken a photography class or two, but want something different, something more about the experience, in a cool location. How about putting it all together in this customized photo tour of India, with a photography leader as your tour host and photography coach? Who: 12 photography enthusiasts. Spouses and non-photography types are more than welcome to join us in India as well (the price is the same for them). What: A 16-day (15 nights) photo tour catering to photographing in the best light of the day, in the field practice in a fun small group setting, and a flexible schedule to allow us to decide how long we stay at each location! Why: Get tips for taking better photos, immerse in some local culture, and have a whole lot of fun in India! We stay in comfortable and clean rooms in properties with local character, history, and style when possible. All your meals are included (except when you have free time) and we also take care of little incidentals like water daily, entrance fees for all attractions, and snacks on the transport for a smooth easy experience. NOTE: We have lowered the maximum number of participants on this tour to 12. This is less than many other India photo tours which include 15 or more people – please look at that when researching and comparing tours! This fewer number of guests allows for a smaller, more intimate group in order to give you the best experience. This means you will have more time with the tour leader, and it's a really nice group size for wandering through the attractions in India. This adventure is designed to guide you to the most stunning locations, chase light, and interact with locals in their natural environment. 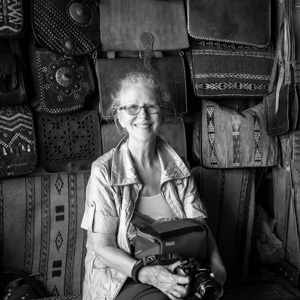 Few regions on earth offer such cultural and diverse opportunities for documentary and travel photography. Come join us as this is a once-in-a-lifetime journey. We’ll embark on a quest not only to capture the essence of this magnificent place and people but to forge new like-minded friends and memories that will last a lifetime. This is NOT the kind of tour that goes to your typical tourist locations. Where others might go in, we go around. Where others have their map, we wander and get lost on purpose. Imagine a bicycle rickshaw ride through the streets of Old Delhi. Yup we do that! This is a custom designed travel tour, by a photographer, for photography enthusiasts. 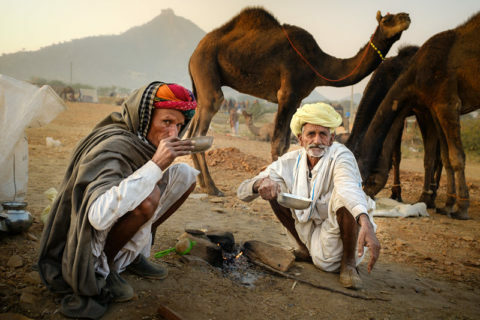 Be prepared to visit one of the world's largest camel fairs in Pushkar. Apart from the buying and selling of livestock, it has become an important tourist attraction and is a highlight of the trip for many of our guests. We get to fully explore each location, which allows you to discover all the hidden gems and meet people on a deeper level. It will be a full two weeks of activities, but you won't feel rushed or pressured. If you want to opt out of an activity to hang out at the hotel, get a massage, or go shopping on your own, you will be able to do just that. 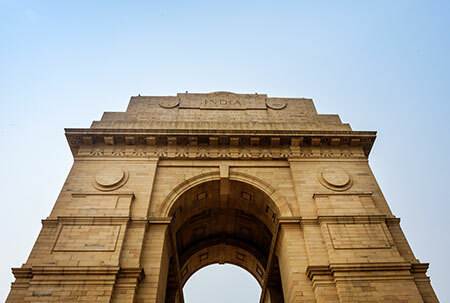 Our adventure will commence in hectic Delhi, a captivating city dotted with dusty bazaars, Mughal-era architecture, massive fortifications, incredible temples, and vibrant people. It’s a city where magic and mystery can be found at the turn of every corner. From Delhi, we’ll continue on to explore India’s crown jewel, Rajasthan, which is truly the Land of the Kings. 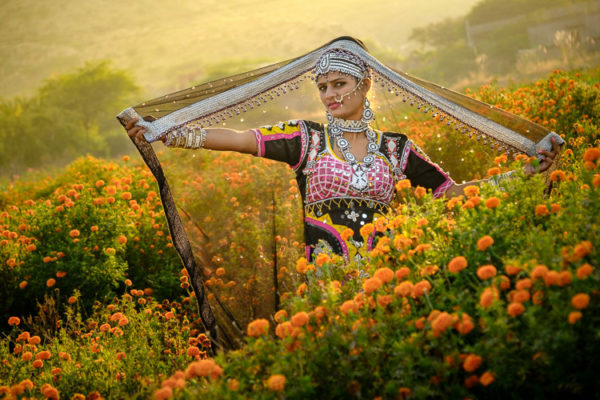 Pride and tradition are the best ways to describe the Rajasthani. A place full of heritage, built by this medieval society where each palace and fort seem like they are straight out of a Bollywood movie set. We’ll hit all of the most important places – the Taj Mahal, Jaipur, Pushkar, Udaipur, Jodhpur and more. Rajasthan is a festival of colors and tradition almost impossible to ignore; incredible warm people dressed in red turbans, the contrasting green and yellow saris and the lure of one of the most picturesque festivities completes an amazing journey into the past. Pushkar Camel Fair is a Highlight! 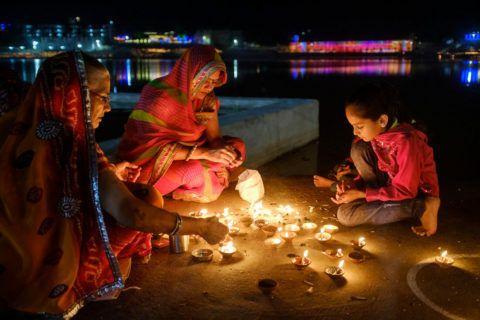 Every first full moon in November, the holy city of Pushkar, India transforms itself. 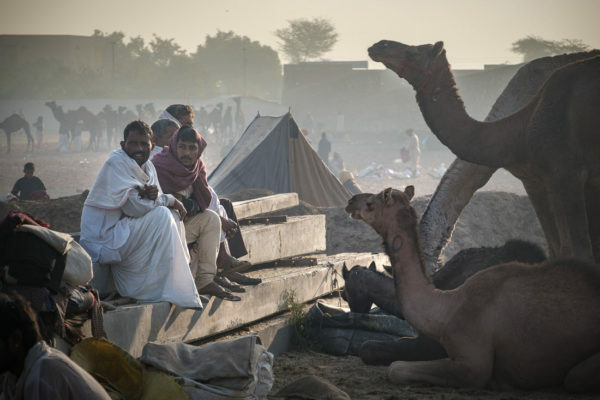 Thousands of people travel to the banks of Pushkar Lake where the camel fair takes place. This is Asia’s largest camel and livestock fair. Men buy and sell their camels, horses, sheep, and goats, while the colorful stalls full of bracelets, clothes, textiles, and fabrics attract the women. Camel races, music, and competitions of all sorts are just a few of the abundance of activities worth mentioning. Namaste – Welcome to India. 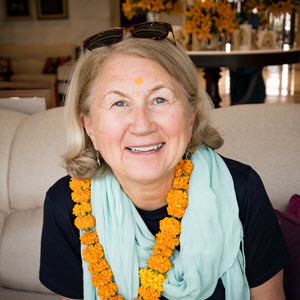 You'll be greeted at the airport and then transferred to our hotel where you'll meet the other guests and your tour leader(s) and have your first Indian dinner together. We'll start the day photographing the Jama Masjid, the largest mosque in India at first light. 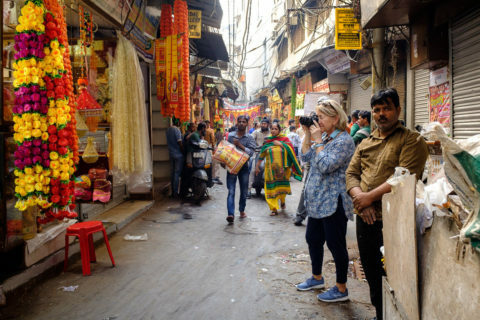 After breakfast, we'll take a walking tour around the Khari Baoli, the famous spice market, and enjoy a bicycle rickshaw ride through the lanes of Chandni Chowk, the shopping center of Old Delhi. This afternoon we'll see the India Gate and drive past the Parliament House. 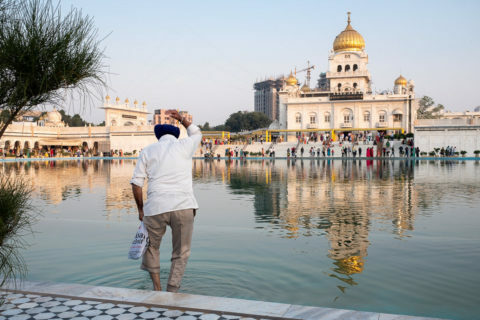 Later visit Bangla Sahib Gurudwara (Sikh Temple) and see the community kitchen and volunteers where they serve thousands of free meals every day to those in need, or anyone who wishes to eat. You can even pitch in and help by making some chapatis if you want! Today we drive to Agra, home of the world-famous Taj Mahal. Agra is one of India's prime tourist destinations for precisely this reason, though its attractions also extend to an array of other impressive historical sights the Taj remains as one of the most remarkable architectural wonders of the world. 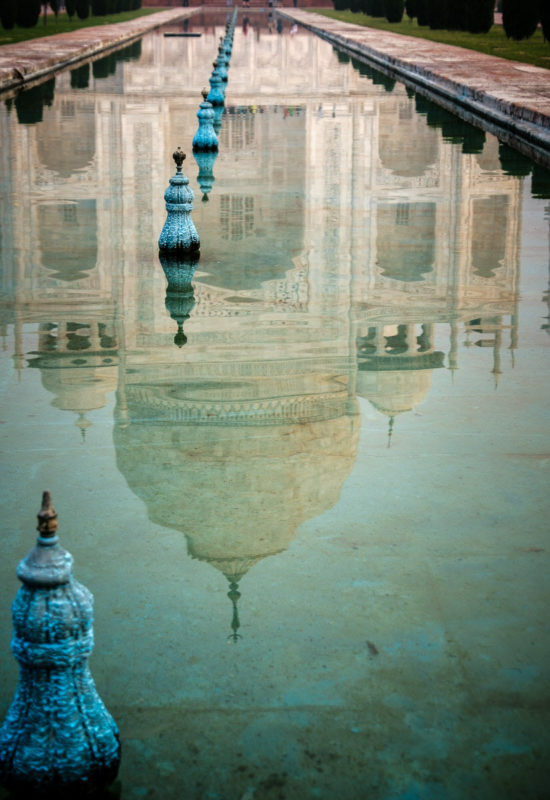 With that in mind, we'll photograph the Taj Mahal from different vantage points and under different lighting conditions. Our next stop will be Mehtab Bagh which is on the back side of the Taj Mahal separated by Yamuna River. 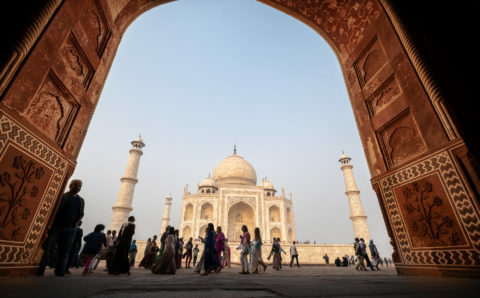 This will be our first encounter with the Taj, and we'll have the opportunity to photograph it at sunset light. Today, get ready for the Taj Mahal. We'll have an early start and reach the venue before sunrise. Few words can describe the magnificence of this monument. Marvel and take wonderful photos as the morning light and colors transform this stunning monument in the beautiful rising sun's glow. We'll return to the hotel for breakfast after thoroughly exploring the grounds and monument. We'll then start our drive to Jaipur and will stop at Chand Baori Stepwell enroute. This is one of the largest stepwells in the world and also one of the most beautiful. After breakfast, we will visit the Hawa Mahal (Wind Palace) for some photography. Then we'll spend time in the oldest and busiest of markets in the walled pink city at Johori Bazaar, a real feast for the senses. Aromatic spices fill the air, while oxcarts, rickshaws, cows, bejeweled women and men with shocking pink turbans jostle through the labyrinthine streets. Just imagine street photography at its best. After lunch, we will visit the Elephant Village. Surrounded by the wilderness, the community is just a few hamlets housing the local villagers. There we will be introduced to elephants, the way of life of its caretakers, and have the opportunity to photograph them. This morning we will begin with an exhilarating photo tour to Amber Fort. Perched on a hillside, this is a beautiful and exceptionally well-preserved structure. We will descend the fort by jeep and walk around the lanes at the foothill, passing by shops and homes to complete a beautiful morning of photography. Later in the afternoon, we will proceed to the lake where you can photograph Jal Mahal (Water Palace). The lake is a thirst quenching place for animals including the (water) buffalos. If you are lucky, you can capture them with your camera while they are bathing. Today we'll drive to Pushkar. We'll check in and have lunch in our hotel with some time for rest in the afternoon or enjoy a swim in the resort pool. Later at sunset, we will visit a marigold farm nearby. There we will have an arranged photo shoot with some local dancers in typical dresses over the mesmerizing and colorful backdrop. Just for us! Dinner at the hotel. Pushkar Resorts offers a variety of cuisines ranging from traditional Rajasthani to European and continental. The focus is on the use of fresh homegrown ingredients. Produce like lettuce, mangoes, cherry tomatoes are grown in-house and used for the daily preparations. Up before dawn to photograph the herders with their camels at the Pushkar Camel Fair. Then we'll be back at the hotel in time for breakfast. Later on, we'll photograph the fairgrounds. Witness the group dance – various tribes show their local performance through dance. See the art and craft market with displays of local produce. After our mid-day break, we'll head back to Pushkar Lake, where we will partake in a pooja ceremony (you can get blessed by an Indian holy man) on the holy ghats. We'll also witness and shoot the Aarti ceremony and the opening festivities of the legendary camel fair. 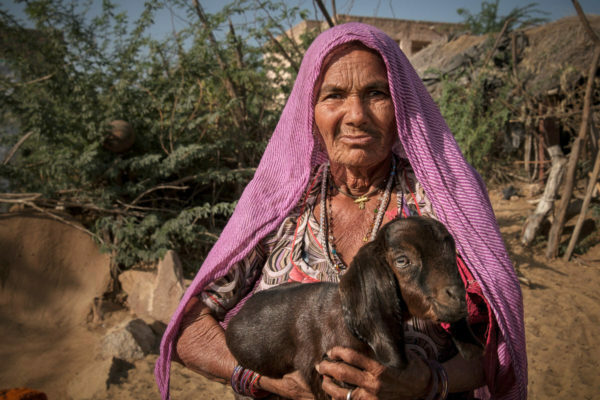 Today we'll drive to Udaipur, better known as the “Venice of the East,” but before that, we'll have a second chance to photograph the camel herders as they start their daily chores. You might even get invited to have coffee with them. We'll drive to Udaipur after breakfast. We'll arrive in the afternoon, and will have the opportunity to capture blue hour from a rooftop overlooking Lake Pichola before dinner. We will start our day with a walk through the street and the ghats. Visit the Sahelion ki Bari (the Garden for the Maids of Honour), an ornamental pleasure garden with fountains and marble kiosks. You'll have some free time to wander the narrow streets near our hotel and have lunch on your own today. There's a great restaurant overlooking the lake right across the street, or you can find something more to your liking. 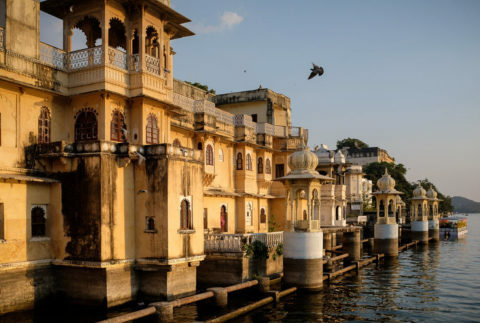 In the afternoon we will take a boat ride on Lake Pichola, which is fringed with hills, palaces, ghats, embankments, temples and offers spectacular views of the city. 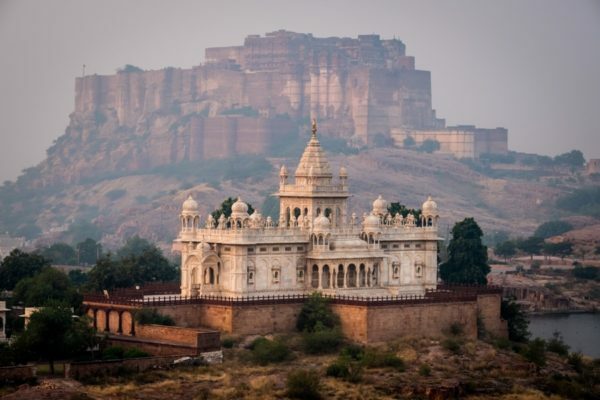 Today we'll drive to Jodphur, home of the fantastic Megharant Fort and other magnificent jewels of Rajasthan. Upon arrival at the hotel, we'll have some time to rest and later on, we'll have a sunset photo shoot from a rooftop with incredible vistas of the city and fort. Prepare for an action-packed day, as we start our morning with a hike around the Rao Jodha Desert Park where we'll shoot the Jaswant Thada. We'll return to the hotel for breakfast and then continue to visit the Meherangarh Fort. 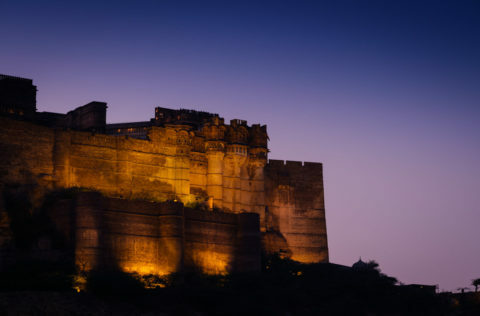 Situated on a low sandstone hill it is one of the most impressive forts in Rajasthan. We'll descend to the town by the back alleys and see the locals going by their daily activities. We'll also have the opportunity to photograph the blue city. You'll have time on your own to get lunch and explore. 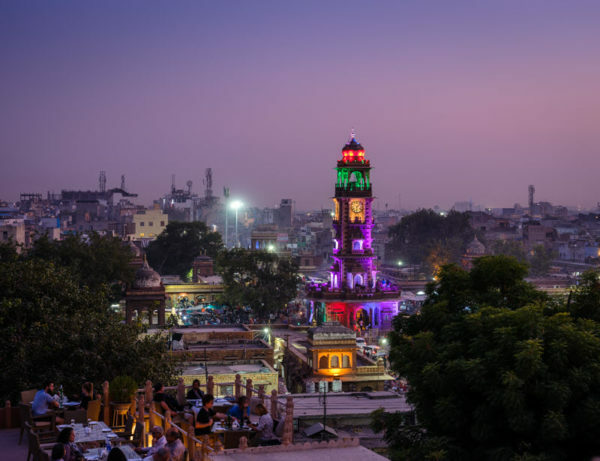 In the afternoon we'll explore the area around the clock tower and visit the Sadar Market where you will meet traders of spices and pickles. We will take it easy today. After breakfast, we'll visit and photograph the Jodhpur Railway station to see how the majority of Indians travel in non-metro cities. For Indians, in general, the railway is a lifeline. Here we'll have the opportunity to photograph this activity. The station is now being used every day by around 156,000 passengers. You might opt to get your hand painted with henna (for the ladies) while in Jodhpur, and the afternoon is at your leisure. We'll head to the desert today, but before that, we'll see an opium ceremony. It may seem an odd way to greet visitors, but the Bishnoi villagers of western Rajasthan are just being polite when they offer you a swig of opium. Which of course makes it rude to refuse not least because the ceremony performed by this isolated community is something to behold in itself. Then we'll drive to Dechu and check in at the Samsara Desert Resort and Camp. 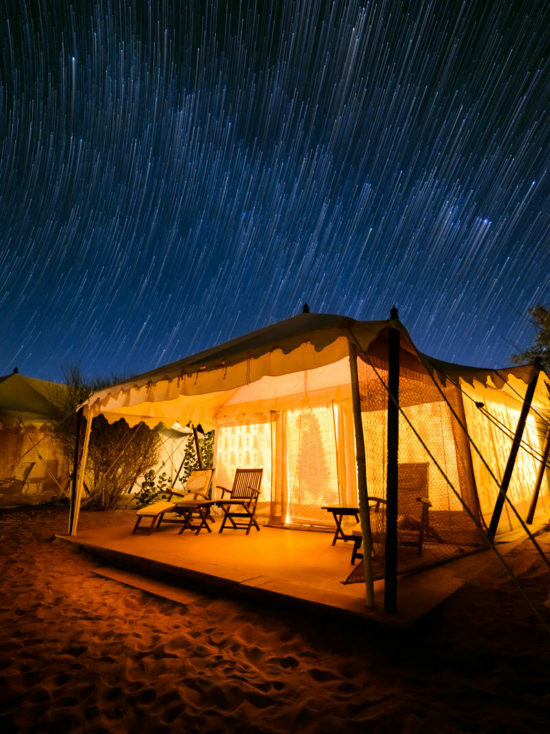 Samsara is an alluring oasis amidst the endless dunes of the Thar desert. Tonight we'll sleep in luxury tents, and we'll have the opportunity to learn and practice some astrophotography. Today, we'll wake up in the desert. We will take a jeep ride to a nearby village, photograph the locals, see some pottery making, and the rural lifestyle around Dechu. We may meet farmers, goat herders, or see men picking peanuts. After lunch, we'll drive back to Jodhpur where we'll have our last and farewell dinner. Today we make our way back to Delhi by flight. You'll be transferred to the airport for your flight home. You can certainly choose to stay for a time in India on your own if you've made other arrangements. As most international flights are after midnight, there are no accommodations booked for this day. So if you're staying on in India, you'll have to make sure you've got a place to stay ahead of time. 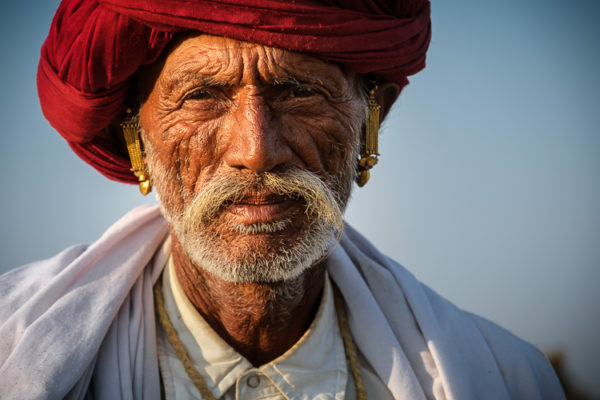 One of your tour leaders for this India photo tour is Daniel Korzeniewski. Daniel is a Miami-based travel photographer whose work has appeared in several publications. 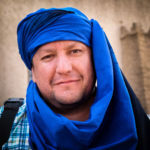 He contributes to various stock photography outlets and often leads photo travel tours. 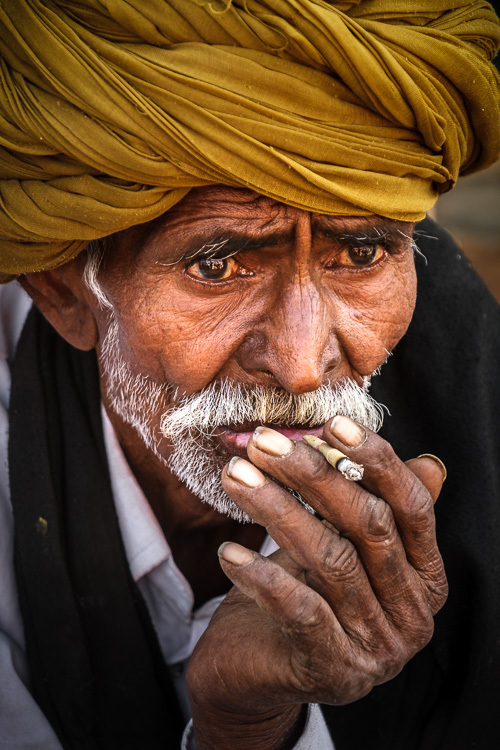 Daniel contributes articles about travel photography here on Digital Photo Mentor and is the photo leader for this photo tour of India, our Morocco photo tour, and also Peru and Myanmar. The pricing will be a little different than for our past tours. Based on feedback from other tours we have decided to reduce the maximum number of participants to 12! This means you will have more time with the tour leaders, and a really nice group size for wandering through the narrow streets of India. NOTE: There must be a minimum of 8 people registered for the tour. Do not book your flights until we inform you that we've reached the minimum number of people. Meals – 15 breakfasts, 11 lunches, and 15 dinners (includes non-alcoholic beverages and tips). 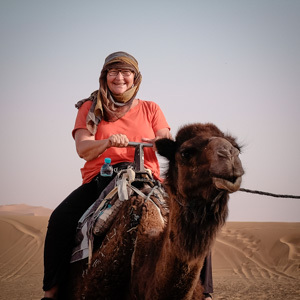 Activities including a rickshaw ride in Delhi, tuk-tuk rides, camel rides, Jeep safari, board ride, and elephant ride (subject to availability). Entrance fees to any historical sites, museums and paid locations. Photography tips on the bus and image reviews in a one-on-one setting (as time permits). Your international flight or other travel to India. Optional activities like spa treatments. 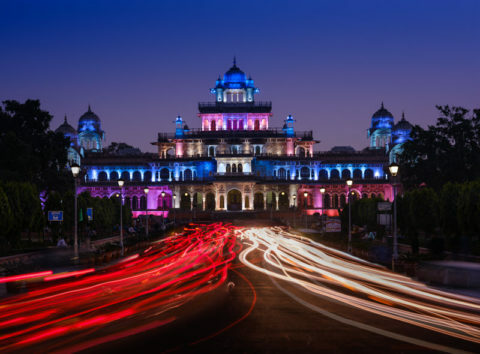 Flights to India: We travel to India through Indira Gandhi International Airport in Delhi, so book your flights to Delhi. We have arranged transportation to your lodging in Delhi for you when you arrive. We just need your flight arrival information to get you picked up at the airport. Flights home from India: The tour ends and we depart from Delhi so make your travel arrangements accordingly. Airport transfer is included if you fly out on the last day of the tour. 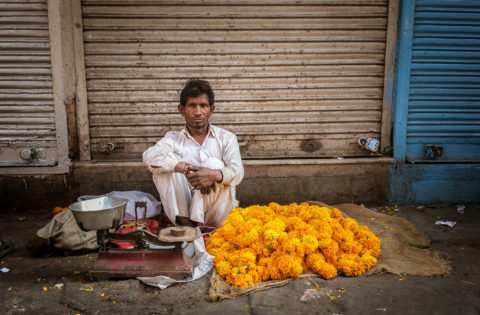 The last day of this India photo tour is November 11, 2019. There are many stairs and hills and some of our accommodations do not have elevators. If you are in good health and fitness level you will be fine. But this tour is NOT recommended for people with mobility issues (bad knees for example). If you request to share a room and we cannot match you with a roommate you will be required to pay the single supplement fee. We do our best to pair everyone up but due to gender mismatches, we may not always have equal numbers of males or females. You can certainly ask a friend to join you and come along to share. What about the food in India? A lot of people love Indian food and we try to eat at local places to try new things and enjoy it as part of the culture. But we also a understand that this type of food is not for everybody. If you do not like trying new things, you dislike curry and Indian food in general, or you cannot eat food with a lot of spices (not just hot/spicy but spices in general like pepper, cumin, coriander, etc.) – there may not be a lot of choices available for you in India. We eat in local restaurants and sometimes in our hotel, and while they always try to accommodate a western palette, there are usually only very few options. For example, you may end up eating a lot of pasta, plain rice, and plain naan bread at every meal. So if you are not willing or able to adapt to trying new things – we would suggest either you either accept this fact and bring along your own food supplements (such as meal protein shakes or power bars) to handle your nutritional needs, or this may not be the tour for you. What if I want to buy some things like a carpet, textiles, silver, etc.? This is first and foremost a photography tour and time for shopping has not been planned into our schedule. If you wish to do those things in your free time that is up to you to organize and handle, our local guide can help you out as well with some tips. We will NOT be stopping as a group at tourist places where you can buy such things. If you wish to do a lot of shopping, you may wish to extend your time in India after the tour concludes so you aren't rushed. Get a jump on seeing more of India before the main tour even starts! We hate to have you wanting more so we have devised this 5-day pre-tour extension, perfect for the more adventurous photographer. 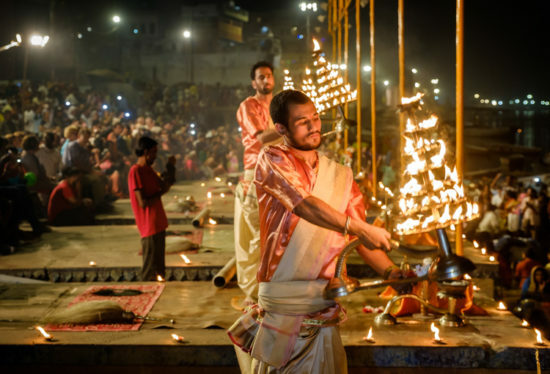 In this pre-tour add-on extension, you'll spend 3.5 days exploring Varanasi and the local attractions a few days before the main photo tour of India starts. You'll arrive in Delhi and be transported to the hotel where we'll have our meet and greet and get to know one another. You can have dinner any time on your own in the hotel. We'll depart Delhi for our flight to Varanasi and be transferred to our hotel where we'll have lunch. 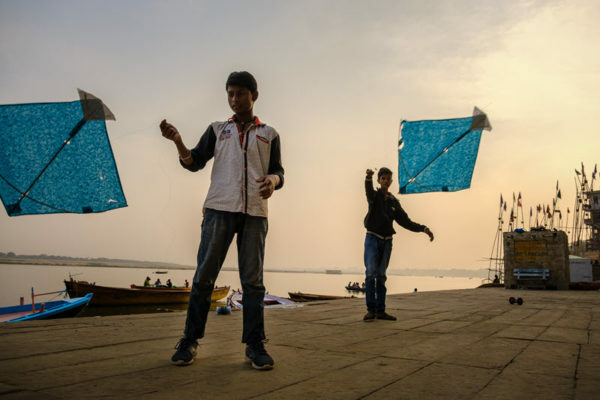 In the afternoon, we will walk down the ghats and arrange to photograph some kids jumping into the Ganges river and flying kites. In the late afternoon, we'll see the famous Aarti ceremony (lighting of many candles and religious ceremonies) on the main ghat. We will go by boat, but we'll also do some photography from the ghat, closer to the action. 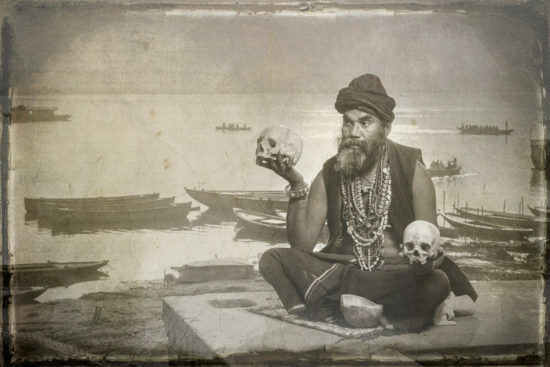 Get up early today for a pre-dawn photo shoot of some Sadhus and Aghori holy men on boats. Sadhus are the painted face holy men of India you may have seen images of before. 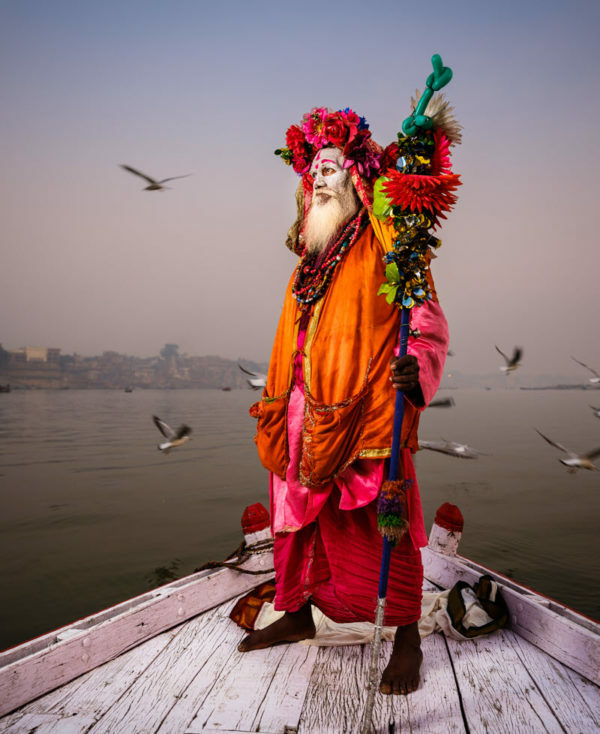 We will have 1-2 Sadhus per boat so everyone will get a chance to photograph them. Your tour leader will have some lighting equipment that you can try out as well (everyone can have a go) so you can learn a bit about using flash. 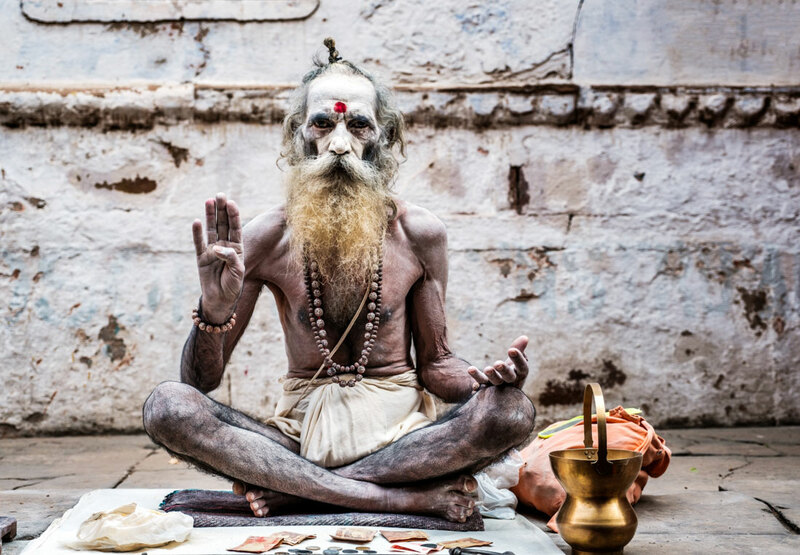 We'll photograph the Sadhus by one of the Ghats (seating on the steps or a platform looking at the Ganges) and make a stop across the river on a sandbar as well. This will be a spectacular morning and a likely highlight of the tour for many. Back to the hotel for breakfast before an arranged photo shoot (just for our group) with Krusti Wrestlers at a private gym. Free time for lunch and rest before an afternoon walk around Varanasi's narrow lanes and markets for some street photography, unlike anything you've ever seen. Cows, sadhus, monks, ladies in colorful saris, water buffalo, and monkeys are all things you may see within just a block or two! Today we will be going by boat to a fishing village in the early morning. Photograph the fisherman throwing nets at the river, then we'll walk through the village where you'll see faces of the many children that will be so overjoyed to see you. In fact, many will want their photo taken, or to get a selfie with you! It's really quite an experience. From there we continue to a coal mine by car where we will have a chance to make portraits and photograph the miners. We'll then head back to the boat to get back to the hotel. We'll have lunch and rest up before a walk in the streets of the old town again. If time permits, you might want to get some of your images reviewed by the tour leader or get some processing tips during the free time. Last morning before departing Varanasi, we'll have one last ride boat early morning to photograph activities and rituals of the ghats from the boats. 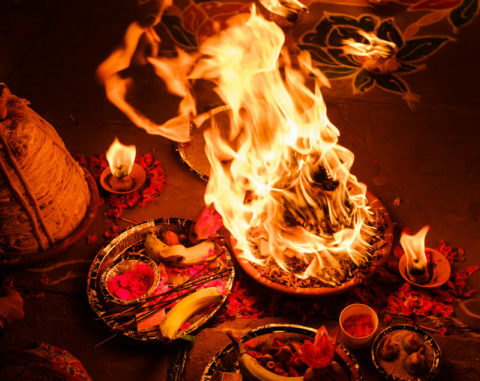 Please note: Varanasi is famous as a holy place for cremations and where they send the ashes of the deceased into the river. It is considered in very poor taste to photograph this. So we will observe it from the boats, but we ask our guests to please be respectful and refrain from taking photos. Back to the hotel for breakfast before we make our way back to Delhi to rest up before our main photo tour of India starts. All transport from Delhi to Varanasi and return. Lodging for all nights as double occupancy. Airport shuttles in Delhi and Varanasi. Meals as follows: 4 breakfasts, 3 lunches. 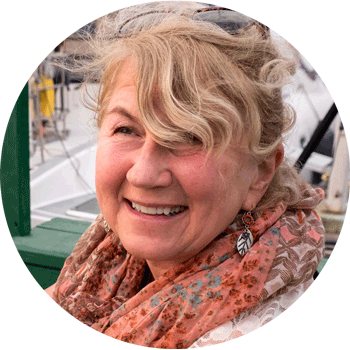 A chance to hang out and shoot with the tour leader and explore together in a small group workshop setting. All organized photo shoots, models and transporation in Varanasi. 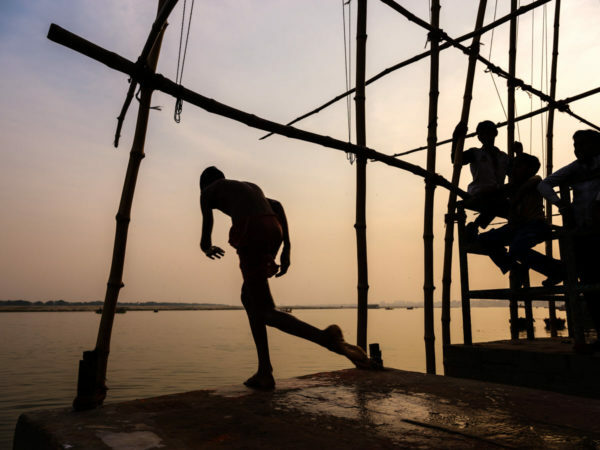 Join us on this photo tour of India. Explore the country, meet fellow photographers from around the world and make new friends. 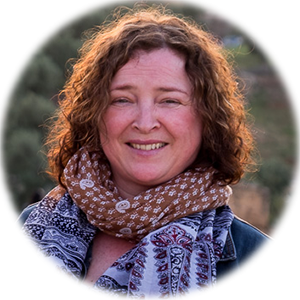 Morocco is a fabulous experience! You'll have fantastic memories for a lifetime, and pictures to show for it, too. 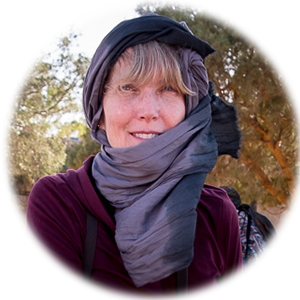 You will see remarkable sights; meet interesting, like-minded people; have ample opportunity to learn from Darlene; experience a completely different culture; and ride camels and ATV's in the Sahara desert! Beyond pleased with the trip! Every day was a pleasant surprise and I really didn't want to know the agenda! We explored places that I would never have found on my own. I have met some absolute wonderful photography friends and I would like to have another gathering of our group! 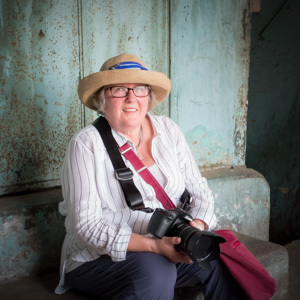 Click here for our complete list of photo tours of Central America, Africa, Asia, and South America, and if you'd like more hands-on, photography education, you'll love one of our workshops, held in Western Canada, Eastern Canada, Mexico and soon Asia.